Welcome to another post that I wish I couldn't write from first hand experience. Like seriously. I hate this. But I process through writing. It is the only way I know how I make sense of this senseless tragedy. I also believe that we experience pain so that we can eventually help others through their pain, so I'm sharing this stuff with you all. I truly truly hope it helps someone. The original title of this article was either "How to not make it worse...."
We had so many amazing people support us during that awful time, from sending messages to having food delivered. I don't know what I would have done without my support system. Unfortunately there were also others who made it worse. Some were merely thoughtless, and had not idea how their actions affected the family. The spirit of this article is not to shame or to complain, but to give you insight. I would know NONE of this if we hadn't experienced it firsthand. A few months ago, I lost my brother in law after several days in critical care. Each day felt like a week, we called it "Hospital time". I must stress how CRITICAL CARE is different than supporting someone in the recovery sections of the hospital. Forget all images of visiting someone recovering from pneumonia, or when you had your baby. Critical is minute to minute life and death. You are woken up from deep sleep (which is rare to come by) to hear updates or make life altering decisions. You learn to read monitors. You become family with the nurses. You spend every moment advocating for your loved one. My husband and I have come up with some tips on how you can be helpful, or at least avoid making it worse, when you have friend who has a loved one in critical care. #1 Reach out, but don’t pressure. The next time your loved one has someone in critical care, reach out to tell them you love them and are thinking of them. Reach out, but don’t push. Let them know you are there if they need you, then take their lead in how much they want to share. You will probably not get a response right away, or ever, but that is OK. It took me a few weeks before I came out of the fog to go back & read all the text messages, and then a while afterward to finally respond. The many texts we got while we were in the hospital were priceless. Over and over, people told us they loved us and were praying for us. It was a balm to our souls. I can not truly express how much it meant. #2 Be patient for updates. Send well wishes and prayer, but don't pepper with questions. Be patient and wait for when they are ready to update you. Critical care changes up and down so quickly, the updates are never accurate. We also found that the moment we starting sharing news was when it felt real. In this age of instant updates and live streaming, I get that waiting is hard, but you must be respectful of the family's choice of what and when to share. We didn't share many updates because we wanted to make sure hid children were informed first. My brother was a man who made friends wherever he went. He was one of my favorite humans on the planet, and many others had the same feeling. Which meant many people wanted update of his condition after his accident. We literally had to assign a person to answer the cell phones in the waiting room, because people kept pestering with questions. Again, this is CRITICAL CARE, not a normal hospital stay. This may sound cold, but the first-tier grievers are the immediate family members. Respect their wishes at all times. Critical care is a small window of time, and no matter the outcome, you will get your time to see the patient or family eventually. Your need for news or closure needs to take a back seat to the needs and wishes of the immediate family. I am not trying to scare people away, but please know CRITICAL CARE IS DIFFERENT THAN NORMAL HOSPITAL STAY. Family must be emotionally & physically present at all time. I truly can not describe it, and I hope you never experience it. Do not show up unannounced, ever, for any reason. Unless you are specifically asked to visit, or loved ones specifically say "open to visitors”, then ALL visitors need to stay away. There are several reasons for this. Critical Care is minute to minute life and death. Decisions are made all the time, updates are essential as you advocate for your loved one. Again, this is NOT the recovery section of the hospital. It takes time and emotional resources (neither of which there are extra) for someone to coordinate when they can meet you at the door, taking away from being able to hear updates, or make vital decisions. If you think you can sidestep this problem and be "helpful" by just coming up to room, then you will most likely interrupt a much needed nap during a brief calm in the storm. My in-laws didn't sleep more than 30 min at a time, on hospital chairs, for five days while my brother in law was in the hospital. Family relives the pain every time they have to tell someone new. Very often the family may simply have finally found a moment of blissful numbness, and having to hug a new person and see their fresh pain will just bring it all rushing back. Or worse, you may walk in when we are receiving devastating news. Send your love in ways that require literally no emotional resources in return from the recipient. When sending a present, send it to the waiting room. Hospitals are perfectly capable of delivering a care packages and food trays. Several people had food delivered to our room, such as simple Jimmy John’s sandwich trays. There can never be too much food sent (again, please don't show up without permission). Any sandwiches we had leftover, we gave to the amazing nurses who became our family for that week. Pay for their unexpected expenses: An amazing couple in our church asked if it would be helpful if they purchased us a hotel room by the hospital; she researched around the area and found a clean and safe place for us, so some of us took shifts using it to shower and sleep. She paid online and all I had to do was show up. Of course my mother and father in law wouldn’t leave the hospital, but some took a few hour shifts to shower and catch quick naps. One night, 2 of us spent 3 hours sleeping, and were called back to the hospital, but the 3 hours in a real bed made a big difference when you’re going on 72 hours of no sleep. My homeschool co-op also took up a love offering, that helped us pay for all the travel expenses we had incurred, and did not have the money to cover ourselves without going into debt. Offer to babysit their children or grandchildren, so family can be at the hospital without parental duties. My friends watched my kids for four days & nights, and I am eternally grateful. It was the best gift I could have received, being able to be fully present with my family, and not worry about my kids for even a second. Clean their house, because they probably left in a hurry. Coming home to flies from dirty dishes is awful. When the call came of the accident, a member of my family didn't even lock the doors or turn off his lights, and left his truck in the driveway with the keys. He was lucky he even shut the front door & turned off the engine as he jumped into the car with someone else and sped to the hospital. Drop off clothes if asked, and again, send to room unless told visitors are welcome. Again, we all left in a hurry. No one had clothes, or toothbrushes. I ended up buying some clothes from the nearest Walmart for family members. There are so many ways to help. This might need to be Number One, because it motivates all others. I know the feeling of helplessness is overwhelming. I. Get. This. It is imperative you deal with your own feelings before trying to help. Do no show up and put the family in a situation where they must deal with your fear and grief alongside their own. Be aware of YOUR need to feel needed. During this time, be on deck to help, but not upset if you don't actually get to bat. I said before how amazing our loved ones were, they reached out and comforted our souls. That said, we also had people who didn't respond with grace or mercy hen we said no visitors. The situation felt out of control to everyone, and some sought control by pushing in, in the name of helping. When you can't say no to someone, there is a problem. Beware of some one's "need to be needed" turning into control. The red flag in a crisis is if someone responds in anger when you say no to their help. Someone violating your boundaries in the name of caring for you is still a form of control. Sadly, I actually had someone so angry when they were asked not to come to the hospital that they cut me out of their life, accusing me of not loving them enough to let them visit to "comfort me." Use the need to feel needed to motivate your generosity, but make sure it does not cloud your judgment in what is appropriate. Again, find ways that you can help that require no resources from the family. "Critical but stable" means someone who is severely ill, but their condition is just not deteriorating at the present time. Critical care changes minute to minute. In other words, the doctors cannot predict what will happen, but the patient is very ill. 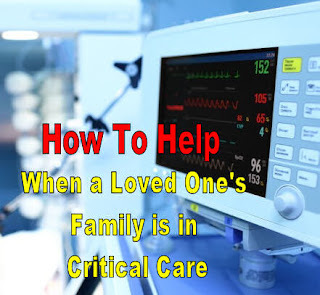 In critical care, any minute, it could change to life or death. You can not control the ripples of what you post, and I promise you, there are ALWAYS ripples. We all had our roles to play in the hospital, even appointing a social media person, the one who all the online updates were filtered through. If you are part of a support system, like maybe an extended family member or friend, the immediate family may share information with you as they process and seek support, but this is NOT permission to share information with others. Do not violate their trust under the guise of trying to help keep others informed. Again you may think you are needed, because the family is too busy to share updates, but always ask before sharing ANY information. There may be several reasons the family is withholding updates. Many times the updates change from minute to minute. We thought my brother was bring transferred to a Chicago hospital at one point, and my aunt actually drove all the way to Chicago, 2 hours away, before we realized he would not be transferred. We kept many details off social media until my brothers' young children , one of whom has a social media account, were able to see him or gets updates from their mother. We would never want them to be updated to news that way, instead of through face to face with a family member. In the hospital, and during the past months, our support system has been amazing. They showed up on a minutes notice when we asked. They backed away when we needed it. I know my friends and extended family all wanted to be there specifically for us, to hug us while we cried, but they respected us when they weren't that person at that moment. They took our lead, cried when we needed to cry, and let us laugh when we need to be numb for a little bit. I am so thankful our support system understood when we cancelled plans. They understood when texts went unanswered for days. They understood when we needed time with just our Immediate Family. It is several months later, and I am just now able to talk about some of the details of those first few weeks with people outside my immediate family. Ask, and then be understanding, when we would rather you have food professional delivered, rather than you drop it off, and require us to interact with anyone. In short, give grace.